Memory Matters received $120,590 over three years to help implement their brain health programs. The grant will assist the organization fill a brain health specialist position, along with covering other program expenses. These programs will be offered to the public to help all maintain brain health by encouraging early intervention and promoting a healthy lifestyle. Memory Matters’ mission is to optimize brain wellness and memory care through education, programs and support for individuals, caregivers and our Lowcountry community. 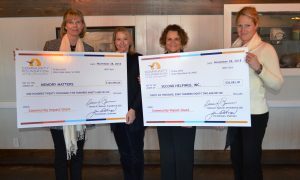 A two-year, $36,882 grant will help Second Helpings fund a part-time coordinator in the Hilton Head/Bluffton area. The coordinator will build relationships with food partners and recipient agencies, manage volunteers, delivery routes, and relationships with grocery stores and food donors. In addition, this new position will be responsible for agency compliance and data collection. The mission of Second Helpings is to alleviate hunger by excelling in the ongoing development and management of a distribution channels between food donors and charitable food providers in Beaufort, Hampton and Jasper Counties. Community Foundation of the Lowcountry awards community impact grants three times per year. Since 1994, Community Foundation of the Lowcountry has been connecting people, resources and needs by helping build stronger communities and assisting donors in making a difference through charitable giving. With over 335 charitable funds, combined assets totaling $70 million and grantmaking and scholarships reaching $68 million, Community Foundation of the Lowcountry is the largest source of unrestricted philanthropic resources dedicated to Beaufort, Colleton, Hampton and Jasper Counties.